This collection of articles chronicles the Labor Day race meet held at the Indianapolis Motor Speedway in September 1910. This was the final meet of its kind at the Speedway as management, unhappy with paid attendance at their July and September events, devised a new type of spectacle that immediately became a classic: the Indianapolis 500. This article covers the final day of the 1910 auto racing season for the Indianapolis Motor Speedway. The big winner of the 200 mile finale was National driver Johnny Aitken. Howdy Wilcox and Ralph De Palma won important contests as well. This is a brief article from August 30, 1910 that reports on new entries for the September 1910 race meet over the Labor Day weekend at the Indianapolis Motor Speedway. Also noted is that Barney Oldfield decided not to enter these races. This article ran in the Indianapolis Star on September 2, 1910 the day before the first day of the meet. There is a nice profile image of Ralph De Palma included. This collection combines articles from the Indianapolis Star and Indianapolis News for the first day of the Indianapolis Motor Speedway's September 1910 Labor Day race meet. The morning paper (the Star) provided more pre-race coverage, while the evening edition (the News) was able to report on some to the race results, including one of Ray Harroun's wins in a Marmon. This collection is from the Sunday, September 4, 1910 edition of the Indianapolis Star covering the first day of events from the Indianapolis Motor Speedway 1910 Labor Day race meet. The Remy-Brassard and Speedway Helmet races were run that day with Eddie Hearne winning his second Speedway Helmet. This article is from the Monday, September 5, 1910 Indianapolis Star and reviews the results from the Saturday, September 3 events. There was no racing on the Sabbath. Good summary of all the races if you want to build a spreadsheet of results. Not easy to read, but patience will reward. Eddie Hearne won the Speedway Helmet race in his Benz and Howdy Wilcox won the Remy-Brassard. Both were 100-mile events. 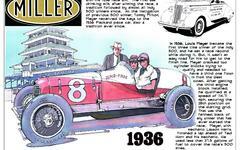 This is another great article on the closing day of the September 1910 race meet at the Indianapolis Motor Speedway. Excellent coverage of the 200 mile finale won by Johnny Aitken. Note, too, the small item on the final page of this collection. It is a tiny but interesting story about Ray Harroun taking a ride in Carl Fisher's balloon, "Indiana," which was being fine tuned by creator and Fisher ballooning mentor, George L. Bumbaugh. At the close of their September 1910 race meet the Indianapolis Motor Speedway track management announced their plan to stage the "greatest race in history." They were right. The article in the attachment below was first published in the May 8, 1910 Indianapolis Star.